As product managers, we deal in ordinals all the time. Well, we call them preferences. “Hey, Joe, is F more important to you than J?” “No, H is more important than F. I don’t care about J.” So we are left with H≥F≥J, or it might be better to just drop J in this case. Hopefully, Joe and the other people you deal with have consistent preferences. Joe doesn’t change his mind every other day does he? Ordinal numbers express order, as first, second, third, …. 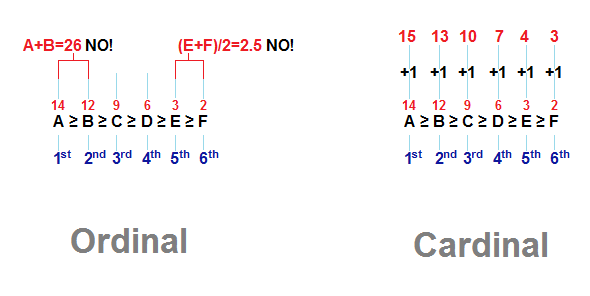 When game theory was created, the numbers in those normal form games were called utils, and utils express values as ordinals. You can’t do much with ordinals. You can’t add them, or back then you couldn’t. I’ve come across more recent mentions in the game theory literature that assert that ordinals can be added, but I’m hearing the screams in my head, as the supports for game theory are kicked out from under it. Same thing happened to calculus as it evolved its geometry roots to its contemporary formal, abstract basis. Calculus didn’t die from this. Later, game theorists found that not having to deal with negative numbers was easier, so they would add the same constant to each ordinal. That doesn’t change the order of the numbers, so this is OK. Adding a constant made the numbers cardinal. Cardinal numbers are about how many. Confusing, but the cardinal numbers are still ordered. I encountered the cardinality of utilities in Game Theory and Strategy by Philip D. Straffin. This book is the second best book on game theory. Read The Complete Strategist by J.D. Williams, the first. Illustrating the differences between ordinal and cardinal numbers. We’ve all seen the limit stuff in our calculus classes. But, in my reading of Carl B. Boyer’s The History of Calculus, there is much more going on. Calculus was a product that went through successive discontinuous innovations. It starts back at the ancient math and demonstrates how Kuhn’s incommensurates played out in mathematics. Incommensurate concepts create gaps that result in subcultures and paradigmatic changes, or opportunities to create new markets. A function converging to a limit as the number of intervals increases. 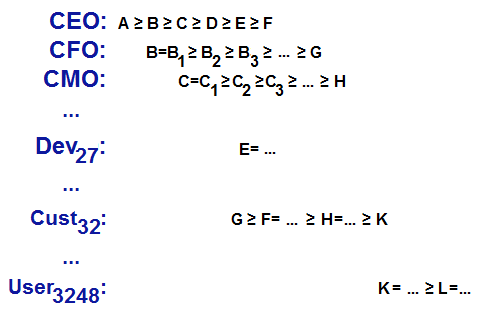 The partitionings in the figure gave rise to two sequences. The number of partitions is directly related to accuracy and computation time of the associated limit. The limit is said to be the sum of a collection of sequences. The surprise was when the Boyer said that the sequences were ordinals. Ordinals refer back to the underpinnings of game theory. I read that a line could be defined as a collection of segments of convergent sequences in Nonstandard Methods in Stochastic Analysis and Mathematical Physics by Sergio Albeverio, et.al. It struck me as a neat way to visualize the sales process. Each sales rep is working a handful of convergences towards the revenue line. Each sales rep has their own process and tempo, rate, or clock–or partitionings of their convergences. There are many sales reps, so there are many partitionings that contribute segments to the revenue line. The whole firm could be visualized as a line as well. Being convergences implies that all of the partitionings are ordinals. The line of convergence could be a straight line in the sense of strategic alignment. But, the line is not restrained to being a straight line. 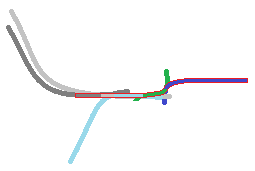 If you want to turn the line, you pick a particular segment of a convergence that is going your way. It turns out that the curve in the figure above is also ordinal as it orders the contributions of the convergent sequence segments. The partitionings need not be the same for each convergence. For a product manager, each segment contributing curve represents a single preference. The resulting curve satisfies all the preferences. It may not be real world to think that satisfying all stakeholders is possible, but that is the goal. When I got involved in the Anthropology for Product Managers tweet chat, I started reading sociology and anthropology books. I came across a mention of scree graph, which turned out to be the end result of a factor analysis. A factor analysis is a multivariate statistical method that determines the multiple regression lines and the weights of each. Each regression line represents a single factor. That factor can be a roll up of a hierarchically organized collection of subfactors. The first three factors typically represent 85 percent of the variance in the underlying data. A factor analysis graph is discrete. It looks like a long tail, Pareto or power law distribution. Plotting a frequency of use for an application’s functionality would give a similar graph. Likewise the frequency of use of each minimal marketable function, aka a network of features delivered as a whole, would give a similar graph. And, likewise for task performance, an ordered collection of feature interactions. The factor analysis is shown on the left. The resulting factors is shown in brown. 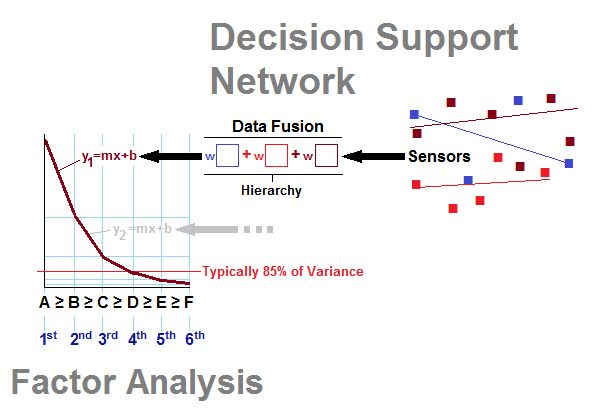 A decision support network (DSS) is shown on the right. The DSS is shown relative to the first factor. The DSS feeds all factors even as I’ve hinted at separate DSSes. The actual data, sensors, and regressions would be different for each factor. In a normal form game, each number in a cell would have its own independent DSS. Factor analysis would be an unbiased way to find product management metrics. When we discuss this topics and pick metrics, we are actually biasing the metrics. Metrics should be relevant to your specific organization. Generic metrics will neither fit your organization, nor measure your performance. When doing a factor analysis collect a wider range of data than you think you will need. Barry Bohem’s Software Economics, got thinner in later revisions, but much was studied before it came down to better programmers made for better programming. Going back to the factor analysis figure, notice that y-axis partitions are relative to the percentage of variance covered by successive factors. The x-axis partitions order successive factors. The partitions for both axes are ordinal, but ordinal only on the axes. You can’t be ordinal in two dimensions, or I have yet to encounter such a thing. Still, there is such a thing as “her second first” given she just broke two world records. The partitions need not be some unit size. Normal form games play in the partitions space and DSS space. Strategies have a frequency of use. In fact, mixed strategies assign frequencies to the strategies used. Frequencies imply power law distributions. Given that normal form games are highly discrete to the point of each cell having its own DSS, they can be discrete like factor analysis. Abstractly a normal form game with a saddle point will divide strategies into different classes: the saddle point, the row and column involved with the saddle point, and the rest of the cells. From a BI/CI perspective, these classes are budget allocations. Will you be watching your adjacent competitor closely, other competitors less so, and non competitors hardly at all? Are you willing to close your eyes and be disrupted? Do you have a budget to spend on data? Once you have allocated your sensor/data (blue triangles) budgets, you get to build your fusion (orange triangles) nodes, your analytical processes. Build these analytical processes with an eye towards continuous surveillance, again a budget issue. How frequently do you review your choice of strategy? How frequently do you actually change your strategy? Ultimately, data feeds your factor analysis. Ordinal partitions determined by the factors. Those ordinal partitions tie to stakeholder preferences. While we have talked about convergences, doing factor analysis to cover 100 percent of the variance is prohibitive. Think in terms of convergences to an epsilon of something between 85 and 100 percent. Now we will go back to the game theory notion of preferences. Every stakeholder from the board to the janitor to the economic-buyer customer and the user in the customer’s organization has preferences. Rationality depends on consistent preferences. The ordinal nature of preferences get messy quick if preferences conflict. As a product manager, dealing with conflicting preferences is a must be addressed issue. Eliminating these conflicts will depend on persuasion and proactivity. Getting this done will just make your life easier. Below is an example of a collection of preferences. CUST32 might give rise to a conflict between the CEO and CFO relative to preference G.
Once we have the partition network defined, we can move back to the partition/interval representation. As a product manager, when you read a job ad, you are seeing a few of the organization’s preferences. As you interview, you will meet a few stakeholders and they will reveal their preferences to you by the questions they ask. As you are on boarded, you will be exposed to more stakeholders and their preferences. Once on your own, you express your own preferences by the amount of time you spend with various stakeholders and how well you understand their preferences, aka how well you know them. They express their preferences, likewise, by whom they spend time with and relate to. The product manager will search the organization for preferences. You can search in a breadth-first manner, or a depth first manner. You can search randomly. As you find preferences you fill in the partitions on your line, the revenue line, the launch line, your career line. 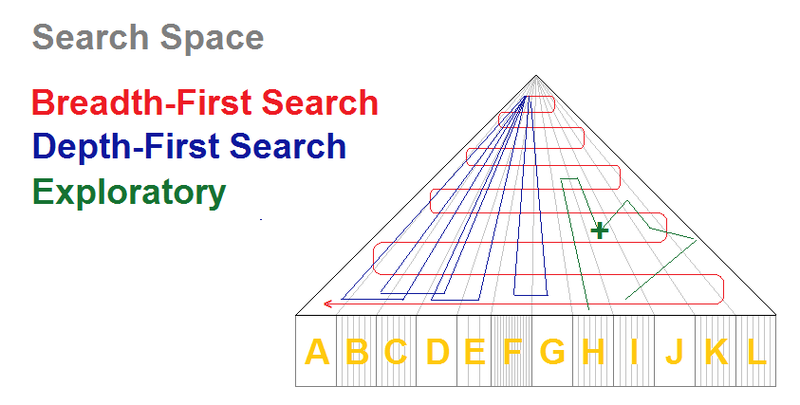 Here the triangle represents the space searched. The preference line is updated as new preferences are found, or changes to preferences are communicated. 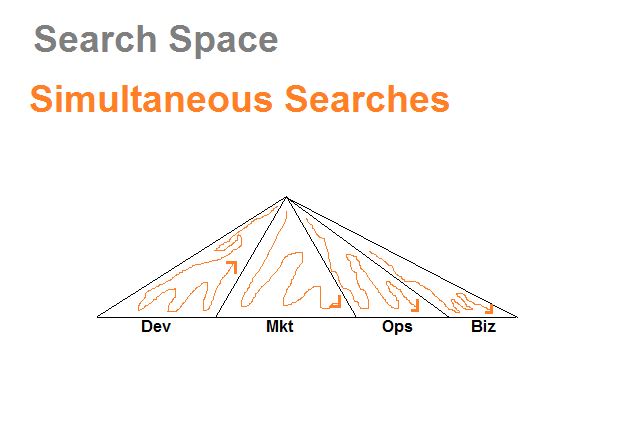 You can partition the search space and search them independently. Once you have your preference partitions laid out, you can draw your own line as a collection of segments of your convergent sequences. You will never complete a preference search. It will spread out over time. It will require proactivity. It need not be ordinal (top down). Searching for preferences is the ceaseless activity of a product manager. Other people satisfy those preferences. Their preferences motivate them. Knowing those people helps you lead them as they satisfy the preferences you’ve discovered. “The God’s Must Be Crazy” for Product Managers. I wrote this a while back. I was going to present this at ProductCamp Seattle last year. Ended up looking for a small Coke bottle and not finding them in the grocery stores there. Christopher Cummings, on twitter @chriscummings01 , discussed some ways to present this topic with me. Thanks for the assistance. Out on the Anthropology for Product Managers tweetchat, #aopm, I’m was always addressing the external facing perspective of how anthropology, or more specifically, how ethnography can improve software product management. Many consumer product companies use ethnography, but they apply it to demographic segments seeking to find insights. Those demographic segments do not correlate to culture and meaning, so the insights are limited. This works, because consumer products, unlike software, are not tools of thought. Software is not usually thought of as tools of though either. Requirements elicitation processes are not usually ethnographic, or focused on culture as a container of meaning. In the internal IT context, this adds costs to the use of software applications. Accountants and economists do not think alike. They use the word “capital” to mean very different things. But, when elicited, particularly with integration in mind, those meanings become conflated. You might find programmers claiming that the differences are lexical or semantic, but at the base the differences are cultural, and work becomes a ritual based on culture and the meaning contained within a culture. When conflated, one party loses meaning, which means that an effort must be mounted outside the use o f the application to massage the data and recover its meaning, so the work can be done. Instead of eliminating silos, these conflagrations of meaning, steepen them, and make them more costly. The costs of massaging data are transferred from IT to the functional units involved, where the costs are expressed as salary, which effectively hides the costs. In an external, B2B context, we construct markets based on meaning-independent, demographic data. Requirements are captured not only within organizations, but across companies. The product manager prioritizes requirements that were captured roughly and in a non-meaning preserving manner. We focus on doing, not thinking. But, doing requires thinking. Doing involves cognitive models that worked long before software showed up demanding that those models be changed. A mess ensues, and average functionality results, and yes, the vendor injects hidden costs into the customer’s cost structure. Our practices are similar in a B2C context. But, it is critical that meaning be the central organizer around which B2B software is written. In Moore’s technology adoption lifecycle, meaning is critical in the b2B early adopter/vertical market, and late market where you may find mass customization around meaning a useful strategy against fast followers and pricing pressures. Even the IT horizontal is rife with subcultures: the computer science programmer population, the electrical engineering programmer population, the accounting financial programmer population, the art school web designers, the systems administrators, the security administrators. Those populations learned different things, have different conceptual models, have different prioritization schemes, have different cultures. We’ve gotten away with ignoring ethnographic considerations, because we build and sell raw technology. We haven’t seen software as a media, as a carrier mechanism that carries content. McGrath described a need to separate the technology layer, just like programmers learning to separate their data structures. Moore talked about products and services as the means to get a technology adopted. The B2B early adopter/vertical market, and the late mainstream markets being content markets, and the early mainstream market being a carrier market, and potentially a content market. Subcultures play a central role in content markets. Subcultures allow us to serve it specifically. Aspect-oriented programming (AOP) gives us the technical tools to stop prioritizing, get the model correct, and stop blaming all the errors on the user interface. But, ethnography in its cognitive focus and AOP help us, from a business perspective, to improve fitness, reduce costs to develop and use our applications, reduce risk, differentiate, and broaden our markets. Attending to the cognitive models of end users requires more than observation. It requires ethnography. Ethnography is a framework and an approach for discovering how a culture defines the world. Ethnography seeks to discover the sortables of the culture’s ontology. Sortables are perceived differences. Populations prioritize sortables as they form cultures. Place has a critical role in what a culture does, understands, and thinks. Place is the source for a culture’s sortables. Reading or watching ethnography can demonstrate how meanings are uncovered. The ethnographer must leave their culture behind. The ethnographer seeks to become a member of the culture. Meaning is uncovered iteratively. The initial meaning ascribed to some behavior may even be incorrect for a time until the ethnographer finds contradictions. I watched “The Gods Must Be Crazy” during its first theater release. I had not studied sociology, anthropology, or ethnography formally at the time. When I started leading #aopm tweetchats, I dived in, but only got far enough to see that many philosophies and frameworks were involved. The movie turned out to be controversial for sociologists. But, in attempting to demonstrate how ethnography is done, the movie is a good place to start. So without further preamble, lets watch the first fifteen minutes of the movie on YouTube, “The Gods Must Be Crazy”. Watch the video before continuing. The first fifteen minutes demonstrate many things significant for product managers from discontinuous innovation, technology adoption, adaptation, cognitive models, beliefs, to de-adoption. We will see how features are embodied with benefits and value, and how unintended functionality expands the offer. We will see how artifacts communicate and give rise to an artifact-based culture. 00:00 Opening shots establishing place—Here, the narrator, the ethnographer, shows us the place, the container of culture. Geography isolates a population. In isolation, that population makes meaning, constructing it over time. The Kalahari desert filters and defines the plants, animals, and people who live within its boundaries. 00:44 Central organizing problem: lack of water—The narrator lays out the central problem for those living in the Kalahari. 01:14 Bushmen—Meet the customer, the population from whom the ethnographer explicates/elicits meaning. Calling them “the little people,” points out the unreliability of this ethnographer, and the films controversial aspects within the ethnography community. 01:36 Adaptation to environment: obtain water—The ethnographer moves on to describe the consequences of the central problem, the lack of water. These consequences manifest themselves in rituals and memes. The root pulp is accessed via the tools at hand using rituals passed down from generation to generation. The thumb is pointed to ensure that not a drop of water is wasted. Thumb use is taught to the children by the parents via repeated demonstration. Parents ensure survival. Parents teach. The meme is transferred. Ritual and meme center on meaning, not doing, not demographics. Meaning is the attractor of ritual and meme. The central organizing problem may never be talked about or made explicit. The lack of water is just so background to the foreground of obtaining water. The same can be said about using leaves to capture dew and dew collection. Again ritual and meme transfer around the issue of a lack of water. If you looked harder, you would find that this population had a deeper understanding of where water can be found than your average urbanite. 02:44 Comparison with the world outside—Here we see contrasts between cultures. The narrator has probably left his ethnographic methods behind, and is expressing a prejudice. The contrast is empirical, observable, and data rich, but glossy, meaningless, and probably demographic, as in not particularly meaning focused. Returning to the Kalahari, the ethnographer contrasts the world outside to that of the subject culture. In summing it up, the subject culture has none of this, that, or the other. They do not have things meaningful to us, but not them. All of the differences boil down to meaning, as in idiomatic expressions where the meaning cannot be translated to another language. The sortables, the ontologies are different. The prioritizations are different. 02:54 Beliefs—”God put only good and useful things on the Earth for them to use. Nothing bad or evil….” The quote describes yet more differences in meaning, sortables, prioritization, and ontology. This is a fundamental belief central to this culture. 03:33 Isolation—”Complete Isolation.” The geography enforces this isolation. The isolation demonstrates containment. 03:43 Airplanes up there—This demonstrates the isolation as well. It also demonstrates how the technology was translated by culture of this Kalahari population. It demonstrates what mathematicians call a manifold, and marketers call a discontinuous innovation. 03:57 Language—The phonetic basis of their language isolates their culture as well. Understanding their language will require a huge effort. Until the language is learned, the ethnographer cannot ask questions. Ethnography is not journalism. Ethnography requires the researcher to participate in the rituals, in the meanings. Observing is insufficient to uncover more than the doing. 04:07 Never punish child, inventive play—More statements around meaning. These statements also talk about risk orientation, experimentation, and adoption. 04:28 Hunting for Meat—More differences; more beliefs, more rituals, more meaning. Work as ritual. 04:50 Apologizing to—This ritual originates in the underlying cognitive model. 05:03 No sense of ownership—The ethnographer rationalizing a conclusion that the ethnographer has drawn. Beware. Ethnography is not the study of what their meanings me to us, but rather what the world means to them. If they have no ownership, then how does it now enter into their world just because an ethnographer showed up, a business analyst, or any other requirements elicitor? Without ownership, there is no capital. So there is no capital either, but the ethnographer omits this. No rock or bone—Another problem, this one waiting for a solution. As a product manager, particularly in B2B environments, the second contrast demonstrates the origins of functional cultures, and vertical markets. Our economy organizes the specialization of labor, learned labor, learned cognitive models. That specialization originates in school. We learn not just to do, but to think, and to be. We are scientists, as in we are (be) scientists, well beyond just doing science. We think the way scientists thing. Well, really, we think the way our programming discipline taught us to think. We abstract, but overlook that we have done so. We mathematicalize the world into nice objective numbers divorced by quite a distance from their underlying meanings. And, we ignore that as a functional discipline we were taught how to interact with our clients, we were taught to live in a silo even as we insist on busting them. Oh, well. 08:06 Back in the Kalahari—Returning to our container. 08:23 “No clocks or calendars tell you to do this or that”—The ethnographer ties us back to our last visit to the outside world, this again to emphasize difference. 08:27 Strange new things appeared in the sky—Different airplanes. Strange as in the first time this species has been seen. 08:45 Something fell from the sky, the Coke bottle—The technology has left the lab! Notice that I did not say product. As a technology, the Coke bottle will undergo adoption and adaptation. During adaptation, it will instance itself in terms of being a product or a service. The Coke bottle will not be sold. Right now it is a technology facing adoption and the risk preferences of its potential adopters. That it fell from the sky in the presence of a bushman was fortuitous. The bushman has the lowest risk tolerance of all the people in their community. They have a moral obligation to face the risks. Bushman are the technology enthusiasts. Technology adoption is a sociological process initiated in the technology enthusiast community. If the technology is not adopted by the technology enthusiast, it will not be adopted by anyone. Products and services are the means towards adoption, but they are not adopted. They are sold, or exchanged for seats and dollars depending on your point of view. Adoption is about wealth creation via value chain creation. Sale or exchange is about cash or a cash substitute. They are not the same things economically. The vendor of Coke bottles were in luck. The act of falling from the sky ties back to the idea that God only gave them good things. This actually reduces the risk of the adopters. 08:53 Tapping on the bottle, exploring it. “Is it safe?”—The bushman is determining the risk of inserting this technology into their culture. When tapped, it did not strike back like that snake earlier in the film. Had it struck back, the bushman would have avoided its teeth, and the Coke bottle would not have been adopted. It would have also gotten bad word of mouth. It would have gotten some mentions, and as we will see later in the movie, bad word of mouth do not get the de-adoption job done. 09:06 “It looked like water, but it was harder than anything else in the world. He wondered why the gods had sent this thing down to the Earth?”—The attribute of being harder goes back to that secondary problem presented by a lack of stone or bone, and to the need to process roots. The Coke bottle exhibited market fit, or in terms of a metaphor, the product as a hole, where the hole was the need for a hammer. This use of a Coke bottle was probably beyond design intentions, but happened because it was cheaper, more optimized, to create a really hard bottle than a flimsy one, particularly given returns, and dissatisfactions with bottles falling from ordinary heights, breaking and spilling all over the carpet. The hardness non-functional requirement was probably sacrificed for cost, as in being indifferent in the face of cost. Use beyond intention is sometimes a goal. We can do this with software by including a macro capability, and APIs. These elements give rise to populations, aka cultures, and then ecologies arise that complement our products and further adoption, adaptation and our revenues. Notice that populations arise, and then cultures are constructed within that population. In fact, a topographical collection of subcultures, a subcultural terrain emerges, and with it communications channels, which if isolated provide pricing opportunities. We do not have to rely on indigenous communications channels or existing subcultures. Making meaning makes revenue opportunities. The clarity of the Coke bottle provided differentiation. Why was it sent here by the Gods? This statement hints that the search for use, or adaptation begins with the technical enthusiast. Their answers will enable further adoption and adaptation. “Hey boss, I found this application that takes care of 65% of our problem.” When the bushman figures out an answer, they discuss it. 09:20 The strangest most beautiful thing the world had ever seen. And, they wondered why the gods had sent it?—Adoption crosses from the bushman, technical enthusiast to the broader population. Only after adoption broadens is the question about why asked again, but this time by the new crop of adopters. The answers will be different from those of the technology enthusiasts, the bushman. Adaptation broadens. Notice that world seeing this thing, not them. That tells you something about them even if the ethnographer, as narrator, is too busy telling his story. 09:34 Finger stuck in the thing. Funny—Now a use, so the Coke bottle has graduated from being a technology to being a product, and that product has a story, a story with a plot, a story with a complete range of emotions, a funny story. Smooth is an advantage. It improves performance of an existing task. 10:00 Make—Music More adaptation. What we do not know is whether they already made similar music, so we can’t really decide whether this is a benefit, as in new task performance, or an advantage, improved task performance. 10:09 Every day they discovered new uses for the thing—Again, adaptation, aka commercialization. Adoption is stable and complete at this point. There are no other populations that will adopt the Coke bottle as technology. A real labor saving device—Just a statement about the success of the Coke bottle’s product manager. Now, if only this was not about seat. We want dollars. And to hell with sideband incomes like selling advertising. Adaptation expanding. Or, should we say demand expanding. 10:28 “But, the gods had been careless, they had sent only one, so for the first time in their lives, here was a thing that could not be shared, because there was only one of it.”—Scarcity has arrived. Demand outstripped supply. Bad product manager. Or, great positioning depending. Economics is embedding itself into their culture. The Coke bottle becomes part of their everyday life, part of their meaning, not just part of their environment. Two ways to use to smash things—The Coke bottle was now a versatile and useful tool. By now the many productizations, particular uses, have given rise to many stories. All of those glowing reviews, so much WOM, but nobody else to expose it to. 10:39 Certainly everybody needed it most of the time. A thing they never needed before had become a necessity—the Coke bottle achieved necessity. Hey did your company IPO yet? Better hurry or it will be too late. Or, is that necessity, as in commodity with its subsequent price and investment issues? Is this the Hype Cycle? Is it unintended consequences? This ethnographer’s notion of ownership is questionable. It’s just economics. Supply outstripped demand. The only time we go down this route is in a disaster and we need food, which we call looting, but is survival a crime? Is it wanting? Anyway, the meanings, the cognitive model of the Coke bottle was expanding and changing. The stories went wrong. The WOM was bad. The reputation sullied. No PR campaign was launched to reverse the negative mentions. Notice also that when they were sharing, the Coke bottle as product was used in an interactive manner as were all other things in their world. 11:28	 Angry at gods—“Take back your thing. Look at the trouble it brought.” De-adoption was now underway. End of Life has been reached. Now if this were a different culture, they would blame the individual and the Coke bottle would be innocent, but these actions had existing meanings within the ontology of their culture. Imagine all the bad press, customer support calls, but no technical support calls. The Coke bottle itself exhibits no defects, just its use. Why do we blame email for spam? But, the gods would not take it back—Well, would you take it back? What are your return policies? Have you booked the earnings, and used them for the forecast that your company based its guidance to financial markets on? 12:07	 Burying the thing—the efforts at de-adopting escalate. The exit barriers are real hell. Is your exit barriers hell on your customers? Of course! 12:34 “I have buried the thing. It will not make us unhappy again.” —Yes, their happiness was at stake. 13:02 Hyena, Warthog, Child finds it—Even higher exit barriers. 14:15 That night the family was very unhappy. 14:26 They did not have a name for it—They called it the evil thing—Negative WOM. What will your customers call your thing? What will they call it twenty years after they quit using it? More importantly, the user has a lifecycle. The user changes their cognitive models over their lifetime. They will encounter new ideas. They will commit to some paradigmatic change (subculture) in their functional culture, and when they do, they will need a different application. Some products can keep up. A life insurance company I worked at segments by populations, and then by life events, events that change needs. They sell into the consumer market. They retain their customers as the customer transitions these events. How long will your products and services retain their customers? Ethnography will help you know why they leave. 15:00 “The thing does not belong on this Earth—Tomorrow I will take it to the end of the Earth, and throw it off.”—How much of an effort is it to de-adopt your product or service? Their world is small in their experience, so the Earth must be small. Their experience defines their world. The film continues on with the bushman’s journey to the end of the Earth. Here the story ties increasingly to the ethnographer’s earlier urban environment and culture. The bushman has fun gaining an understanding of the urban environment and culture, stands at the end of the Earth and de-adopts the Coke bottle, the evil thing, one last time, and then returns to his family. These people of the Kalahari no longer live in the desert. They were forcibly removed to the city where they live in poverty, so much for progress and economics. Their culture lost. You are currently browsing the Product Strategist blog archives for September, 2010.